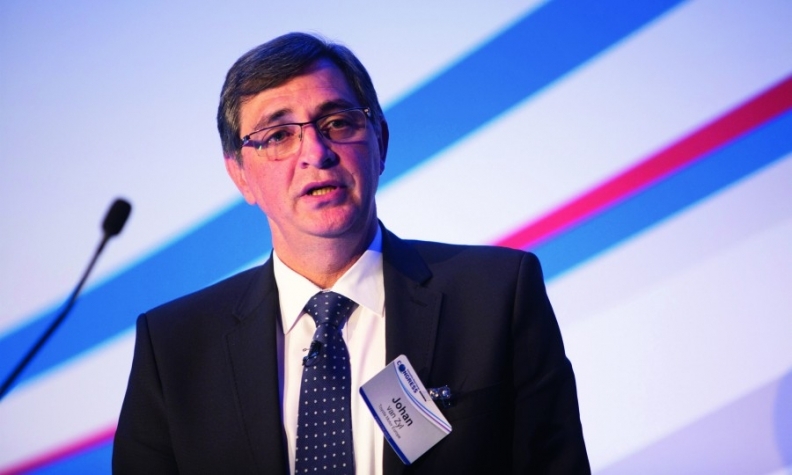 Johan van Zyl: "Regulatory changes and stricter emissions targets are supporting our decision to go with hybrids." Toyota's big bet on hybrids is paying off in Europe, where customers are looking for an alternative to diesels. The automaker expects models with its gasoline-electric powertrain to account for half of all its sales in the region by 2020, up from 40 percent now. One way Toyota hopes to lure new customers to its hybrids is by making them more powerful. Toyota Europe CEO Johan van Zyl outlined the plan during an interview with Automotive News Europe Correspondent Andrea Malan. What percentage of your sales in Europe are hybrids? Currently, 40 percent of our sales in Europe [which for Toyota includes Russia and Turkey] are hybrids. Our target is to reach 50 percent hybrids in Europe by 2020. Today, the share is close to 50 percent in Western Europe and rises to 60 percent in countries such as France. Toyota announced at this year's Frankfurt auto show it would soon enlarge its hybrid powertrain range by adding more powerful versions. What's driving this? Our customers are rational buyers who look for a favorable total cost of ownership but they also want driving pleasure. We think this move will enable us to cater for those looking for more power. Will those new hybrid powertrains replace your diesels? We have tried to differentiate ourselves by having hybrid variants in every segment except the A-segment [minicars]. When we launched the C-HR crossover, we decided not to offer a diesel. Today, 77 percent of C-HR sales in Europe are hybrids and the figure is 90 percent in France. We'll decide model by model [whether to exclude a diesel variant], but our future is hybrids. Why doesn't Toyota stop offering diesels altogether? Diesel is still necessary for vehicles such as the Land Cruiser [large SUV], which comes with a 2.8-liter, Euro 6.2 compliant engine. In this kind of engine, we can provide all the necessary technology to make the diesel clean. For smaller models, it is more difficult [to justify the added cost of the technology needed to reduce diesel emissions]. We will decide model by model, but the chances of us launching a new diesel engine in a passenger car or LCV are limited. Main challenge: Getting diesel owners to switch to hybrids. What is Toyota's current diesel share in Europe? It's about 15 percent, down from 25 percent in 2015. It's below 7 percent in Italy, where our hybrids are very popular. Has the backlash against diesels helped Toyota? Regulatory changes and stricter emissions targets are supporting our decision to go with hybrids. Will you add 48-volt mild hybrids to your powertrain mix? For now, we stay with our full-hybrid system. Will you launch more plug-in hybrids in Europe? To achieve CO2 requirements, we will need to balance our powertrain mix in Europe. To do this we will offer full-hybrids, plug-in hybrids and battery-electric vehicles. In which segment will Toyota offer its first electric vehicle? It's a matter of cost versus the possible selling price. Today, it is difficult to make a business case for a small battery-electric car. It is easier to launch an SUV or premium vehicle as an EV. Why doesn't a hybrid version of the Aygo minicar work? We sell our Yaris [subcompact] hybrid at a premium position in its segment. That's how we can create a business case for the model. The A-segment [minicar] is much more focused on cost. At that level, a business case would be much tougher to make. That might change as the technology gets less expensive. Will PSA's takeover of Opel affect the joint venture you have with PSA in the Czech Republic? Based on our discussions with PSA, there is no change to our relationship. What is Toyota's reaction to plans by some European governments to ban vehicles with internal combustion engines by 2040? We take those announcements very seriously because we have to determine how we are going to change our offering in the market. When I hear about banning this or that technology I think it would be better to say: "This is the target. If you achieve it with this technology, that's fine." That would also help stimulate research on improving internal combustion engines. What share do you foresee for battery-electric vehicles in Europe by 2025? It will depend on technology developments such as range and the availability of a charging infrastructure. The share will also depend on what mix you need to offset your emissions requirements to avoid penalties versus the losses you're going to make on these vehicles. What is your forecast for the European market for the rest of 2017 and 2018? We see Europe [including Russia and Turkey] at 20.4 million. We see some slow recovery in the Russian market, from 1.4 million in 2016 to 1.5 million or even 1.55 million. That is positive, but still slow. In terms of the future, the impact of Brexit on the UK is a big unknown. So far, the UK market has held up much better than we anticipated. For Western Europe, we still see some growth in the market and a small increase in 2018.